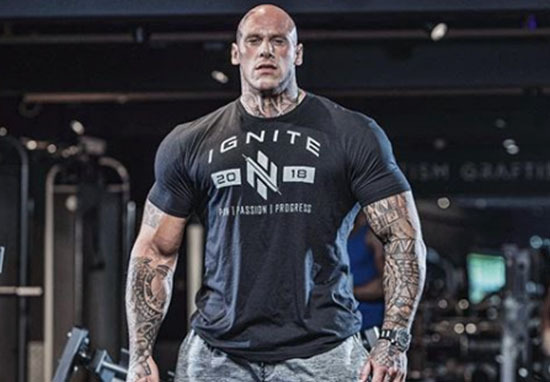 MMA fighter Martyn Ford has revealed what he looked like before he became a huge human wall of muscle. You might recognise the 33-year-old from Kingsman: The Golden Circle or Redcon-1, and if you do, you’ll know he’s one impressive looking man. The actor-slash-bodybuilder is 6’8″ and entirely ripped, making him quite possibly the scariest man on earth. Having recently signed on to join Poland’s KSW, or to give the MMA promotion its full title, Konfrontacja Sztuk Walki, Martyn ‘The Nightmare’ Ford hopes his fight career will take off. I think it’s pretty fair to say the news is out, and YES I Will be stepping into the cage for @ksw_mma VERY SOON, no doubt there will be critics, I’m here to prove those people wrong. All energy is good energy, the KEY to success is to take every energy source giving to you and use it !!!!! Training is going incredible, body is changing daily, fitness is coming back, energy is through the roof, now all that is left to decide is …….. do I go by the name THE NIGHTMARE!!!! Who wants to see Koshmar in the cage !!! Of course, Martyn hasn’t always been as huge as he is now – and it hasn’t been a lifelong dream of his to become an MMA fighter, either. Martyn originally had dreams of becoming a professional cricketer, but was forced to give up playing after suffering injuries. The 33-year-old rebuilt his life and career around fitness training, allowing him to achieve his current incredibly ripped physique. I was lost when I finished playing cricket. I was convinced I would turn pro and that would be my life set out. With injuries, bad luck and just losing love for the game that never happened. But the void was never filled. I knew deep down I needed to succeed at something, that I had an ability to shine in some way. I have always been so focused and committed with a crazy ambition to win. Fast forward to today, I’m travelling the world with fitness, made two films with three more already lined up. Not to mention three businesses to my name. Proud of how far he has come, Martyn shared an incredible throwback to his Instagram page, showing what he looked like before he got ripped. Well, before he got as ripped as he is now. I think a lot of people would still be satisfied with the impressive abs he had in the ‘before’ picture. I think this picture should be inspirational for us all, because let’s be honest, who hasn’t spent an evening necking back WKDs? We could all be like Martyn! The body is a phenomenal machine. We are all able to transform ourselves mentally and physically into what OR who we want. Sure sometimes there are limits, BUT change is still very much achievable. You have to appreciate that sacrifice will have to be made, the biggest battle is committing to a plan, following through and staying on course.